It's been almost a year since I was adopted so I wanted to give you an update to let you know how I'm doing. I love my life now. There has been some trials and errors adjusting but that's to be expected. I've learned a lot, come along way and realize there are more nice people in this world than mean people. I have 1/3 of an acre that I call my own and my favorite snack is "Barkin Bacon." I know how to "sit and shake" and learned to "rollover" in 2 days! I gained a little weight,I think it's called "Happy Fat." My Mom & Dad are the best and take me for rides in the truck often. To be truthful I'm a little spoiled. It's been the best year of my life! Thank you and all of the other wonderful people that had enoough faith in me to save me and give me another chance at life! About a year ago or more there was a meth lab drug bust in a commercial area in Sacramento, and the druggies let all their dogs loose. The dogs numbered about 6 or 7 and ran together, and Animal Control was periodically called out, and managed to capture all but two. Doreen who worked nearby started leaving food for them, then noticed other people were doing the same. There were random dog bowls at various locations in the area. Doreen started leaving the food out at the same location everyday, then noticed someone else was also doing this. Doreen finally met Robin, the woman who was feeding them and they coordinated efforts so that the dogs would receive regular meals twice a day, and fresh water even on weekends. They named the dogs Luna and Wylie. Luna finally became friendly enough that she would let them pet her nose. Wylie was always stand-offish. 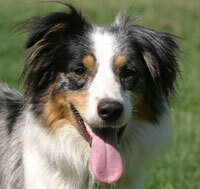 Wylie dragged his hind quarters one day, and Robin said he had ben hit by a car. Neither woman saw him for a week, thought he was dead, but then he showed up again and seemed fine. They told Karen, another friend about the dogs, and the three women started going out on weekends to try to catch them. They had this elaborate plan that they would catch the dogs, take them to the doggy wash place and get them cleaned up, and then take them to the SPCA and pretend they were our dogs that we were relinquishing so they would not get destroyed. Karen even bought new collars and leashes decorated with happy faces, but the dogs eluded them. Doreen started talking to people at work about the dogs, and a lot of people had seen them. People started giving her a few dollars here and there for dog food... she always had a case of dog food in the trunk of her car, and so did Robin. She followed the dogs one day for about a half hour, and they led her on a two mile radius that went across busy streets and through business parks, finally ending at the levy where they disappeared. During this period of time, Doreen contacted Animal Control, and they told her that they had attempted numerous times to catch the two dogs, but were unsuccessful. Doreen arranged for an officer to meet to try again. The dogs didn't show! Someone bought the dogs an Igloo and they started putting food in the Igloo and gradually, the dogs became more comfortable with their care takers, and started to hang round more and gained some weight. Wylie, and Aussie mix would take treats from their hands. 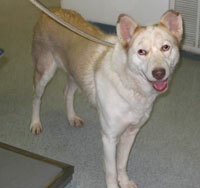 Luna, a husky-shepherd mix came into heat and Wylie started getting very protective of her, and started challenging people who worked at the businesses. Animal Control was called again, and this time the officer was able to capture both dogs with the tranquilizer gun. Wylie was shot while he was eating. When he was hit, he ran off and Luna stayed close to him, even when he went down. Because of this, she was also easily captured. 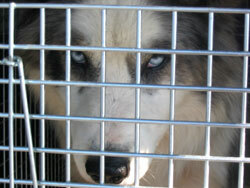 They were taken to the shelter, and Doreen, Karen and Robin contacted me for help. I figured they would both never pass temperament testing and might even be vicious. I spent an entire afternoon testing Wylie and Luna separately. I watched as the Animal Control officer went into each kennel to slip a lead around their necks... Wylie wagged his tail and pushed into the officer for pets. Luna was more shy, but went along with what was being asked of her. Although too shy to adopt to the public at that moment, I felt they both had potential and showed no signs of aggression towards humans. The gals got on the phone and with the help of Dragana, a local rescue volunteer, found a Foster Home in Reno that was affiliated with a dog rescue group in Lake Tahoe. They wanted to foster Wylie and Luna. So last week, I pulled Wylie and Luna from the shelter, got them vaccinated and heartworm tested and they both did GREAT at the vet's office! 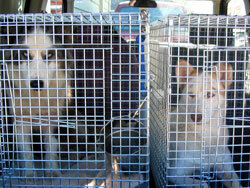 Doreen and I drove them to Reno and they both seemed to enjoy the car ride.Luna is now spayed and Wylie is neutered. They are becoming socialized and are available to meet. 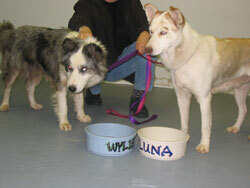 Both these dogs need owners who will be patient, who will give them lots of time, and who will keep them safe. Crates and high, sturdy fences are required. Both dogs have been adopted to understanding, patient new families. Thanks to everyone who took the time to give them a chance!